We provide a full range of canine security training courses designed to equip students with the skills, knowledge and understanding to enable not only the safe handling of dogs, but also how to extract the maximum benefit from using canine assets within a security framework. Many of our courses are suitable for the general public aspiring to become dog handlers, as well as members of the armed forces, police and prison service who wish to take on a role in the private security industry. Our experienced instructors are made up of ex military and commercial personnel who have recognised civilian and teaching qualifications and benefit from recent operational experience. All courses are run from our training academy at Luton Hoo, Bedfordshire, which is located just off the M1. This rural site is ideally placed to enable a wide variety of training scenarios. For course dates and further information please call 01582 458355. 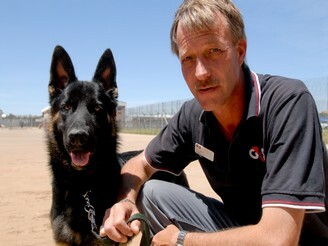 Expert bomb sniffer dogs are now helping to protect G4S customers in Afghanistan as part of a brand-new service. The Risk Management team recently took on the four explosive detection dogs, two handlers and two Afghan kennel hands, who are now protecting the British Embassy. 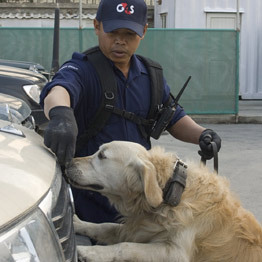 Shortly after the launch of the canine team, they were also awarded their first commercial contract – a one-day sweep of the Serena Hotel prior to a VIP visit. “It came about after RONCO wound down their operations and gave us notice of their contract at the Embassy – and we decided to buy the dogs and employ the handlers directly,” said Chris Pook, Afghanistan Programme Director. The dogs work a two-week rotation at the Embassy, afterwards returning to the Anjuman base for a fortnight. “While they are here they are used for occasional work on our main gate, but we also take some time out for training and to let them have some fun as well,” Chris added.